My second batch, I decided to try a modifying a version of the traditional newbie brew recipe: Joe’s Ancient Orange Mead. See the Original Recipe here. This one I had some issue with. I went off book from the recipe online, and used a wine yeast instead of the baker’s yeast that this bare bones recipe uses. The baker’s yeast does not have a high alcohol tolerance, so it tends to leave it very sweet. This sweetness will balance out the bitter flavor from the orange pith (white flaky stuff on the inside of the peel). The wine yeast, however, will ferment it dry and draw out that bitterness. I’ve since read that for the best orange flavor, you really don’t need the juice or any part of the inside of the fruit, just the zest. So that’s what I tried adding to help my brew. But that just added more orange on top of that bitter flavor. So I got the idea of trying to make it more like an orange creamscicle. So I added some lactose sugar (which is interesting because yeast cannot metabolize it – no need to prevent fermentation). I also soaked some vanilla beans in it – my first attempt with these that did not come across well. (The key to vanilla is soaking them in vodka and making a tincture out of it and adding that in to taste. I’ve tried soaking them directly in two different meads and the flavor does not come through at all). So there were a lot of missteps with this batch. It finally turned out not too bad, but required a fair bit of tweaking. Don’t be afraid to experiment if it’s not perfect right from the get go. Also, aging can do some strange things, especially when spices are involved. Flavors tend to mellow out and mi together, while others that weren’t always noticeable can become more prominent. Tasted this again recently. It’s a great example of how flavors can change with time. I originally could not taste the vanilla at all when it first finished. Now it’s very strongly vanilla flavor. Probably a bit too much at this point. I’m hoping it mellows out with a little more age. I’ve read about it a lot, but it’s one of those things you have to experience for yourself to really grasp just how drastically these things can morph over time. If you use vanilla, I’d recommend the tincture route. 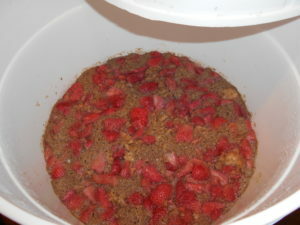 Soak it in a small amount of vodka and use that as an additive to your mead – to taste. It should be much more precise. Raisins add nutrients to the mix, as honey alone is pretty nutrient deficient. The instructions are basically dissolve the honey in the water and throw everything else in. Shake/Stir vigorously to aerate, and let it sit for two months and a few days until it clears up. If you wait long enough, even the oranges will sink to the bottom. Zest and squeeze out the juice of the orange. You will not need the rest. Steep the spices in some hot water for about 20 minutes before adding this water to the the container. Mix everything up, aerate and leave it to ferment. Should finish fermenting between two to three weeks. Age as appropriate.